Boston is a maze of twisty streets difficult in a car, easy to get lost in on foot. Here's a summary of major landmarks and districts to help you get oriented. 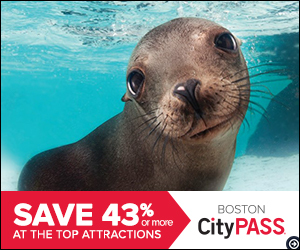 Boston (map) has advantages: train and bus terminals are in the city center, and Logan Airport is less than a 15-minute taxi or subway ride from the center. 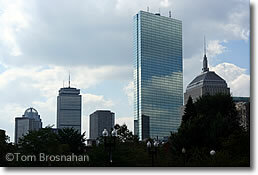 Above, the mirror slab of the John Hancock Tower and the stolid rectangle of the Prudential Tower (to its left) tell you this is Boston's Back Bay. 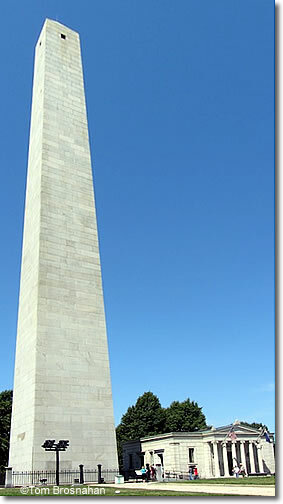 Below, the Bunker Hill Monument in Charlestown. Cambridge, across the Charles River.